On April 14th, 2000, Adam met Eric Moro, a producer from Hollywood Screentest.com, that was completely enamored with the show and wanted to showcase it on the site. At first it was just a spotlight, but the owner of the site thought it should be one of the four sitcoms they were launching the site with. "Not only did 4TVs play the starring role in their very own internet sitcom, I was hired by the company to edit and produce not only "Movie Minded" but all of their other projects. Jess and I were literally weeks away from having to move back to Columbus, and this singlehandedly kept us in LA." Over the next several months Adam & 4TVs filmed 3 pilots and one episode that was featured on isyndicate.com for sale to websites across the world along with HST's other original programming. 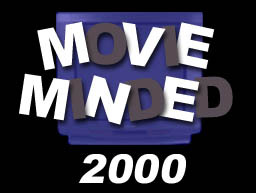 In September Adam was finishing up the 2nd Movie Minded episode, "X-Men", as well as editing the other shows. By early October however, the internet crash had taken its toll, and no one was willling to take a gamble on Hollywood Screentest's original programming. They decided to refocus their efforts on selling the internet technology of capturing "screentests" and Adam's talents were no longer needed. "At the time, it seemed Hollywood Screentest wasn't the brightest spot in the evolution of 4TVs, but time has put a different light on it. Besides keeping 4TVs in LA, it also provided an incredibly interesting footnote to the evolution of 4TVs, and hinted at the characters to come."